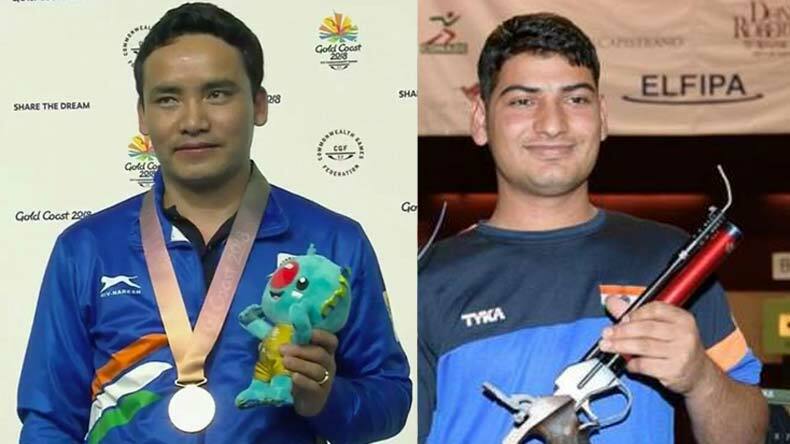 Indian shooter Jitu Rai clinched the gold medal in 10m air pistol event at Gold Coast. While Jitu Rai won gold, his counterpart from the Indian contingent Om Prakash Mitharval finished third to claim the bronze medal in the same event. Rai, who successfully retained his gold medal at the Commonwealth Games also scripted history as the Lucknow star shooter set a new record at the Games with a score of 235.1 in the final. Reaching new heights on Monday (Day 5) of the 2018 Commonwealth Games in Australia, Indian shooter Jitu Rai clinched the gold medal in 10m air pistol event at Gold Coast. While Jitu Rai won gold, his counterpart from the Indian contingent Om Prakash Mitharval finished third to claim the bronze medal in the same event. For the win Jitu registered a score of 235.1 and Om Prakash scored 214.3 for the top finishes at the podium. Rai, who successfully retained his gold medal at the Commonwealth Games also scripted history as the Lucknow star shooter set a new record at the Games with a score of 235.1 in the final. Before taking centre stage in the shooting finals at Gold Coast, Om Prakash Mitharval had given his quest for CWG medal a flying start. In his stellar campaign prior to the CWG in Australia, Prakash emerged as the best shooter in the qualification round. The Indian shooter equalled the Commonwealth Games (CWG) record on his way to qualifying for the final at Gold Coast. Om Prakash had shot 584 in the qualifying round. His score eventually equalled the record set by Indian Samaresh Jung at the 2006 CWG in Melbourne. While Prakash went into the final stage with a record-levelling effort, Rai on the other reached the final with a decent score of 570 before winning the gold medal at Gold Coast. To earn a finish at top of the podium, Indian shooter Jitu Rai also set a new record in the 2018 Commonwealth Games at Gold Coast when he shot 235.1 in the final. “India rejoices in the victory of Jitu Rai. He once again demonstrates his prowess, and wins a Gold in the men’s 10m Air Pistol event. Congratulations,” PMO tweeted. “Congratulations Army man @jiturai, for a record-breaking score of 235.1 in the 10m Air Pistol Finals and the gold medal, your second one. Maza dila diya, Sir !” former Indian cricketer Virender Sehwag congratulated Jitu for his gold medal win at Gold Coast.